In most cases, there are no free lunches, but once in a while there comes an opportunity where it is free. If it is a large amount, it is definitely worth considering. In this case, we are talking about your retirement income. If you go to a restaurant and get a bill for Rs 1,000 and someone wants to pay a third of it, will you say no? Or you are buying an air ticket and there is a 30% discount available, will you take it? Many times, this offer piques our curiosity, and we do check if there is a catch. As kids, we have been told several times – there are no free lunches. Conventionally, people have been using Fixed Deposits to help them generate a regular income, which they can use for their retirement needs. 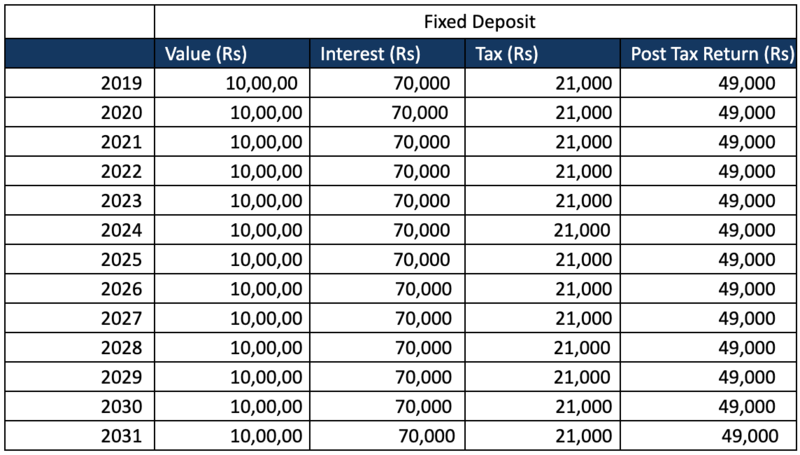 If you are in the full tax bracket, you would notice that the Rs 10 lakhs invested in a Fixed Deposit will generate about Rs 70,000 of annual interest and post taxes this comes down to Rs 49,000. Instead of investing in a Fixed Deposit, suppose you invest in a liquid fund, you will get similar returns. Moreover, the liquid fund in turn invests in government bonds, band deposits or bonds of AAA companies (risk is nearly the same as the FD). Interestingly, for the first three years, you pay short term capital gains tax on you capital gains from liquid funds. As a result, the first three year returns of the liquid fund and Fixed deposit are the same. Post that third year, you get indexation benefit on your long term capital gains. Assuming a 5% rate of inflation, your annual income from the Rs 10 lakhs will go up to Rs 64,000, up from Rs 49,000 – you get nearly 30% more. That too paid for by the government. If this is not a free lunch, I don’t know what a free lunch means. 1. When you invest in a FD, you may lock it in for 3 or 5 years (post which the rate would shift to the prevailing rate then). Liquid funds returns, on the other hand, may change a bit every day. Our past analysis suggests that, you are better off with liquid funds, over FD, even adjusting for this change. 2. Risk : An FD is considered risk free (though technically if a bank defaults, only your first Rs 1 lakh is protected, but it is unlikely to happen). Liquid funds, on the other hand invest in a combination of government bonds, bank deposits and AAA corporates. In our analysis, if you pick and choose the liquid fund well, the risks with both these instruments are not materially different. 3. The government may change its tax rules. 4. In an FD, the monthly or quarterly interest amount promptly lands up in your bank account. Whereas in a liquid fund, there is no income and you need to sell down the holdings to the extent of income required. This requires some effort, or to work with someone who can manage this process for you. On the whole, there are moments in life where if you are smart, you can ensure nearly a third of your retirement needs are taken care of by the government. Our suggestion – take it.